The Chinese communist regime’s health regulator announced the recall of made-in-China pharmaceutical valsartan, which is being subject to a recall in the United States and Europe. The U.S. Food and Drug Administration said on July 13 that 29 types of single and 51 types of combination valsartan medicines are being recalled. The European Medicines Agency (EMA) announced a recall of the drug on July 5 when it was informed by China’s Zhejiang Huahai Pharmaceutical—a major global manufacturer of generic valsartan—that the drug had been contaminated by a substance called N-Nitrosodimethylamine (NDMA), which has been linked to cancer. China’s National Health Commission said that the recalled drug, which is used to treat patients with high blood pressure, shouldn’t be used for the diagnosis and treatment of diseases, Reuters reported on July 30. The Chinese regime’s health regulator also said there were six local companies that used valsartan manufactured by Huahai, according to Reuters. Five of the firms have issued recalls, Reuters reported. Rosemary Gibson, who is a senior adviser at The Hastings Center and an author of several books on health care issues, said that the tainted valsartan shows how defective medicines and pharmaceutical ingredients made by Chinese manufacturers are becoming a health hazard for other countries. The U.S.–China Economic and Security Review Commission said in an annual report published in January that China has been a “prolific source” of defective and counterfeit drugs. “Chinese consumers may prefer U.S. pharmaceutical products due to concerns over the quality of domestic drugs. China has been a prolific source of counterfeit and defective medicine. In 2012, Chinese authorities seized 77 million domestically produced gel capsules that were created from industrial waste and contained excessive levels of cadmium,” the commission’s report said. It added that, for more than a decade, China has been a “key producer” of counterfeit drugs. 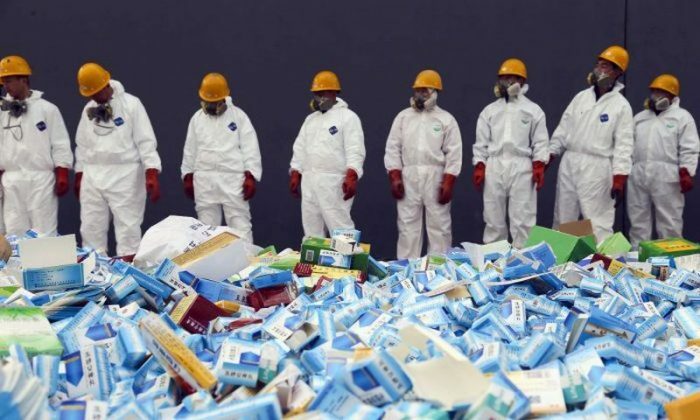 About 90 percent of all counterfeit pharmaceuticals seized at the U.S. border were from China, Hong Kong, Singapore, or India. “While quality concerns may boost U.S. pharmaceutical sales to China, the inability of Chinese regulators to restrict counterfeit medicine risks the health of U.S. consumers,” the report stated.